BSNL aims to capture the low price market by launching handsets priced at Rs.1000 and below. The telco will sell the mobiles under the ‘BSNL phones’ banner.Sources say that the mobiles will be based on single-chip technology. The SIM card will be non-removable and the mobile will remain on the BSNL network only. BSNL is not targeting the top-end market very aggressively. BSNL sees a low-cost handset a key to increase the market share. It even expects a reasonable return of 12-14%. Currently, the cheapest handset in India is monophonic and monochromic (black and white). It is on the GSM platform and is priced at Rs 1700. It offers only basic features. The cheapest CDMA handset is available for Rs 1,999. Finnish mobile handset manufacturer Nokia and Reliance Communications Ltd have joined hands to market the Nokia 1255 mobile handset in India at a price of Rs 1,999. This is Nokia’s maiden offer of a CDMA handset in the sub Rs 2,000 range and is aimed at first time mobile users. There are, however, cheaper CDMA handsets from other manufacturers being offered by operators in the country. 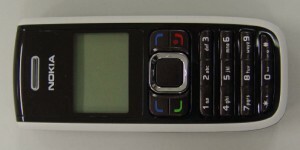 Nokia 1255 is an entry level black and white handset and has features such as a two-way hands-free speakerphone, voice recorder and a calendar with an alarm clock among others. The Government has alloted low power 3G spectrum to MTNL, BSNL, Hutch and Bharti for testing.TRAI will finalize pricing and allocation details by end of this month.Sources say that 3G spectrum allocation will be made available for less than a month. Strength of spectrum allocation will be 1,000 times less than the actual 3G spectrum. TATA Teleservices had sought 3G trial spectrum but was not considered.Reliance had sought the 1900 MHz Band which did not conform to the International CDMA 3G trial norms. Online Social Networking is the latest buzz create by sites such as Orkut, MySpace etc. The buzz which is now restricted to the PC may soon be seen on your mobile phone. It can be called Mobile Communites as ET points out . new buzz as a Money game to tap this elite crowd. gaming-based community across mobile and internet. about to unveil big plans around it. I would like to take you through the various plans available from Airtel for GPRS. Tata Indicom CDMA Data Card. The above plans not only allow you to connect to the internet from your mobile phone but also allow you to use your Laptop or PC . Its can be be a life saver in a place where you dont have internet access otherwise and cannot find a cyber cafe. Airtel and Hutch are coming up with Zero Rental GPRS service as pointed out by Mobile Pundit. Airtel Chennai offers a zero-rental GPRS service for its post-paid customers at pay-per-use rate of Re 1 per 100 kilobytes. Which works out to Rs 10 per 1MB. Hutch is also planning to bring out something similar. Its great news for those people who wish to try the service but not willing to shell out a monthly rental. 115 mobile operators, who offer the Windows mobile solutions worldwide. Indian Telecom giant Bharti Airtel has announced a tie up with Microsoft, which will enable Airtel users to access various MS Office applications and other multimedia products on their handsets. Microsoft Windows Mobile 5.0 will target an estimated four million small and medium enterprise potential users with access to MS Office (Outlook, Word, Excel, PowerPoint and Internet Explorer), multi media functionalities like camera, MP3 and video recording. Aircel Cellular, one of India’s leading mobile service providers, has launched Phone Book, a unique and useful external phone book service which offers subscribers unlimited memory to store their contacts’ addresses. This service will be useful for all subscribers who have lots of addresses to store but the memory in their handsets is a limiting factor, and/or those who tend to lose their cell phones. Cost Rs 25 per month. Aircel subscribers can register for this service by messaging Pbook to 2222. Unlimited phone contacts can be stored in Aircel’s Phone Book. The security of individual phone books is taken care of through the individual user’s password given at the time of registering for the service. The service is available at a nominal fee of Rs 25 per month. Airtel -cellular telephony operator, on Thursday announced a 100-million dollar deal with software major IBM to deliver a suit of new product services and applications under a single delivery platform. “Bharti has partnered with IBM to deliver India’s first “service delivery platform” to enable it to deliver a suit of new range of services to its over 25 million customers,” Manoj Kohli, Bharti-Airtel President, said. The cellular operator is also investing over 100 million dollars in this delivery platform, he added. IBM, which has been managing the telecom network operations of Bharti-Airtel for a while, will develop, manage and operate the service delivery platform for Airtel. The platform will enable Bharti to have an integrated environment that will incorporate all of Airtel’s content and application services under one platform, Kohli went on to say. Paymate is founded by Ajay Adiseshann, formerly the CEO of Coruscant Tec, a mobile value added services company and Probir Roy, formerly CIO of StarTV and Co-Founder Coruscant Tec. The Company is advised by Alex Kuruvilla, the former head of MTV Networks in India. RIM’s Anil Ambani is now eyeing the GSM Market in India. He plans to invest over Rs.1600 cr for the same.Reliance Telecom Limited, an Anil Dhirubhai Ambani Group company, which operates GSM service in eight circles mainly in east and north-eastern states, has worked out expansion plans to increase coverage to about 4,300 towns from the existing 330 towns, according to sources. RTL operates GSM services in Kolkata, West Bengal, Assam, the north-east, Bihar, Orissa, Madhya Pradesh and Himachal Pradesh circles. The expansion plans for Anil Ambani’s company comes in the wake of reports that the GSM-based mobile service has shown phenomenal growth in India where out of the 100 million mobile subscriber base, the GSM-based mobile user base is 80 million. A company official confirmed the development, but declined to give further details. be an ambassador for a truly global brand synonymous with quality, innovation and style. Helping India get more and more connected with Motorola phones is my mission for the next 24 months. It is amazing to see how we as a nation have adopted this technology and today it is pervading every sphere of our lives. Speaking for myself, I am a complete techno-geek and rely on these gadgets to keep myself organized. I absolutely love the Motorola products. They are really cool and stylish while offering the best applications. I am excited about making the difference, Right here! Right now! !”As Motorola’s brand ambassador, Abhishek will support marketing and branding efforts for the entire Mobile Device product range. Motorola’s brand quotient of youthful spirit, daring to be different, being bold and smart is in sync with Abhishek’s bold and daring attitude, enigmatic looks and unconventional style. Motorola, the world’s second largest handset-maker, on Wednesday said it will spend $100 million in stages to set up a manufacturing facility near Chennai, in an attempt to boost sales in one of the world’s hottest mobile markets. “India is a vitally important market for Motorola and as a strategic manufacturing hub offers compelling value proposition and strong cost efficiencies,” Ron Garriques, executive vice-president at Motorola Inc, said in a statement. Once its unit is up and running, Motorola would join companies like LG, Samsung, Elcoteq, XL Telecom and Nokia that have set up production facilities in the country. All told, some 20 million handsets are expected to be produced in India this year, a figure that could go up by 50 per cent in 2007. Motorola today signed a memorandum of understanding with the Tamil Nadu government for setting up its facility on a 300-acre Sriperumbudur Hi-Tech Special Economic Zone, where Flextronics and Foxcon will also have their facilities. Motorola will be allotted about 70 acres of land in this SEZ. The company plans to make an initial investment of $30 million, which it expects to upscale to $100 million in the next one year. In the first phase, it will set up a facility over 2.5 lakh sq ft, which will manufacture mobile handsets, including sub-$30 mobile phones, and support production and assembly of network base stations for products across Motorola’s Network and Enterprise portfolio. It will also manufacture set-top boxes. Addressing a press conference, Stu Reed, executive vice-president (integrated supply chain), Motorola Inc, said the manufacture of products like sub-$30 mobile handsets would go well with the government’s plan to offer rural connectivity. He added that the plant would initially focus on serving the domestic market and later look at exporting products to neighbouring countries, West Asia and Africa. The manufacturing facility is expected to be operational in early 2007 and will have a capacity to manufacture one million handsets per month. It is likely to employ about 3,000 people in the initial phase and the total employment is expected to go up to 7,000 in the second phase. In addition to the company’s investment, it will facilitate its supplier to move into the park. Motorola’s manufacturing initiative will supplement its six R&D centres in India. To demonstrate the power and potential of m-learning, a seminar is being held at Gandhinagar Club, 4th Main Road, Gandhi Nagar, Adyar, Chennai-20 at 3.30pm on Sunday June 11, 2006. Besides students preparing for GRE , students preparing for CAT, GMAT, SAT and other aptitude tests for campus interviews, progressive parents and educationists would also find this seminar immensely valuable. A live demonstration of m-learning will follow. Register now to confirm your participation. The number of seats is limited. Malaysian interest in Indian telecom does not seem to be ending. After the Maxis – Aircel and Telekom Malaysia – Spice deals, there are reports that Malaysia?s state investment firm – Khazanah Nasional Bhd is in talks to buy a one-third stake in Idea Cellular. Khazanah might take up a 33% stake conglomerate Aditya Birla was selling in Idea, Malaysia?s Edge weekly said.The Aditya Birla group has recently doubled its stake in Idea to 98% by buying out the Tatas. Birla has stated that it wants to cut its holding to 65%, but not through a sale to another mobile operator. Khazanah would be a good bet for Birla as it is a financial investor with government links.What is interesting to note here is that Telekom Malaysia, which recently bought a 49% stake in Spice, is controlled by Khazanah. Therefore, Idea and Spice will have a common investor in Khazanah if the deal goes through. Whether this leads to the merger of Idea and Spice is anybody?s guess.